AED training is a valuable and free benefit for customers of AED.com. Pairing up with Webex by Cisco provides unparalleled support to new and existing clientele. Unfortunately, purchasing an AED (automated external defibrillator) is not a one-and-done solution. To be fully compliant and ready for a rescue situation, AED owners need to have completed a few important steps. One of these steps is AED training. AED.com now provides free online AED training to customers who purchase an AED. Webex by Cisco provides the technology necessary for AED.com’s AHA (American Heart Association) certified CPR/AED instructors to perform live, interactive AED training sessions that are customized to the specific AED that customers have purchased. Complementing the training is a question and answer session after the AED training has been completed. “Guiding the people we serve through every step of an AED purchase is necessary. Our job isn’t done when money changes hands; we make sure they are fully prepared for a cardiac arrest emergency,” said Justin Darby, Director of Marketing. Making sure each step is properly executed assures the greatest chance of readiness for life-saving situations. For this reason, AED.com recently launched a partnership with En-Pro Inc., an industry leader in AED program management, to help with implementation, program management, and post event reporting. AED Program Management, AED Training, and AED.com’s special Peace-of-Mind Loaner program are set in place to provide the maximum amount of customer support and satisfaction that goes above and beyond industry standards. 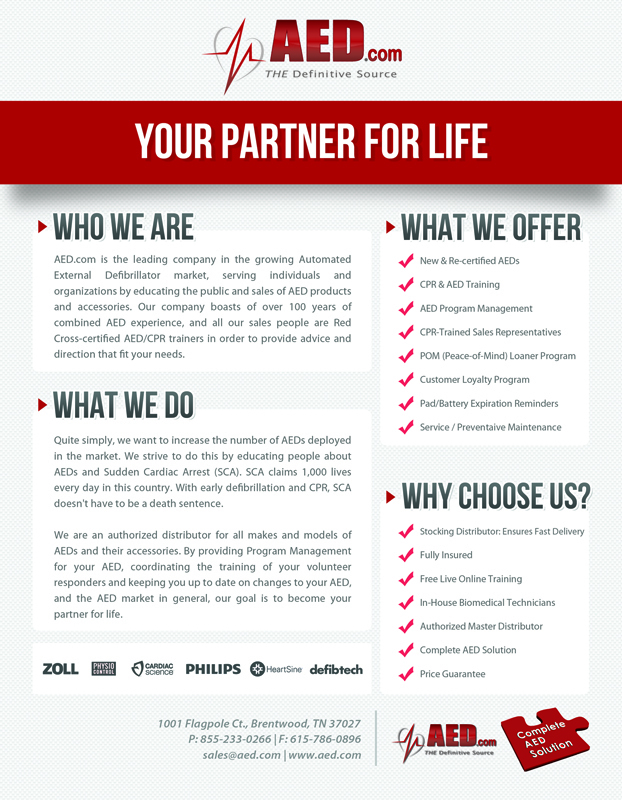 AED.com is headquartered in Brentwood, TN and provides AED products and services to over 20,000 customers in all 50 U.S. states and 35 countries worldwide.